This was the second episode in a row for which I was able to predict the ending. The episode began with Fitz reassuring Olivia that everything would be okay. She had just been outed once again as the President’s mistress, and as we have seen her do before, Olivia runs. When Fitz calls her to ask where she is, she assures him that she will call him, that she just needs to get out while she still can. However, for most of the episode, she remains unavailable to him while he tells everyone that he needs to wait for her before he can make a statement about their relationship. Mellie takes the opportunity to show up at the White House and promise to tell the world that Fitz and Olivia are not involved with one another; that in fact, the pictures were misleading because Olivia’s boyfriend was at the White House at the time as well. All Fitz needs to do is apologize for serving her with divorce papers. Fitz stands his ground though and tells Mellie to get out. Last week I predicted that it was Liz, together with Abby, who leaked the photos. It turns out that I was half right, as it was Liz who did so. But when Abby discovers this, instead of being incensed on behalf of her friend, she pledges to stand with Liz and work with her, rather than against her. With advice from Cyrus, Abby tells the President that Olivia will never make a statement with him and will never want to be subjected to the scrutiny of a public relationship with him. This leads Fitz to call Mellie and apologize, taking her up on her offer to help him cover up his relationship with Olivia once again. Meanwhile, Olivia and Jake work on a case involving a scorned son who has possibly killed his father. The young man, like Olivia, is on the run, avoiding arrest for the murder that he denies committing. It is revealed that he is in fact guilty though, and also that his father had not treated him wonderfully in the past – something that Olivia can much relate to. As Olivia rests on a motel bed, she recalls Fitz’s love for her – how he chose her, how he told her that she can’t fix the fact that he loves her – and hears her father’s warnings as to why she should not pursue that love. She also recalls Jake telling her that she loves Fitz and after she confides her feelings of fear and shame to Jake, he reminds her that it isn’t a crime to love the President. In fact, Fitz has a similar moment with the VP as she rebukes him for his affair. He admits that he’s just a man who fell in love, and really, I wonder, why can’t these people have real love? Don’t they deserve real love just like anyone else? The shame the Olivia feels is a problem, and although she says this to Jake and not Fitz, Fitz knows how she must feel and as he has done before, makes moves to let her go. After hearing his voicemail, Olivia realizes how much Fitz actually loves her. So much that he would sacrifice his own happiness for hers. So, she faces her fear. She moves beyond her shame. She chooses love. Instead of continuing to run, she faces the reporters waiting for her and she tells them her truth. She begins to accept the love that she deserves. She says YES. 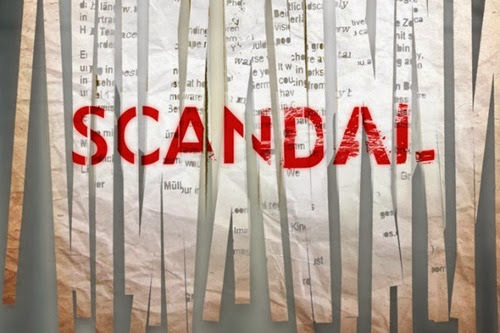 I had predicted the end of this episode based on the title and comments Kerry Washington made about how she couldn’t imagine how Olivia could do what she does in the very last minute of the episode. While most of the episode focused on Olivia running and being ashamed, in the end she stands in her truth. Now, the story can continue with the ramifications of that move. Will it ruin her? Close down her business once and for all? Will she continue to be shamed and referred to as nothing more than a mistress and a whore? Or will she and Fitz be able to be together and in love even though they are both public figures? All of that remains to be seen. If you watched this episode, what did you think?